Porzellanmanufaktur (PMA) was integrated into the empire of the economic enterprises under the direction of the SS-Reichsführung. Within the structure of the economic conglomerate the manufacture belonged to the office W-I (that was 'Steine und Erden' of the Reich) under the direction of the SS Sturnannführer Karl Mummenthey. The founding of the PMA was initiated by Heinrich Himmler as a prestigious object, whose products were intended to "support the education to national socialist people". The figurine program of the manufacture included historical soldiers' figures (among others Fredrich the Great on a horse), and other works of the Hitler Youth, Hitler heads, acts, peasant representations, animal figures, Julleuchter and Julteller, (Jul-tide lights and Jul-tide plates) and other 'Germanic' ceramics. It was founded on 3 January 1936 by the three artists Karl Diebisch, Theodor Kärner and Franz Nagy and the SS Obersturmburführer Bruno Galke. Since the 1920s, a small manufacturing company had been located on the site of Lindenstrasse 8 (today Reinhard von Frankstrasse 8) in the Munich district of Allach, on a site adjacent to the Krauss-Maffei armory factory. 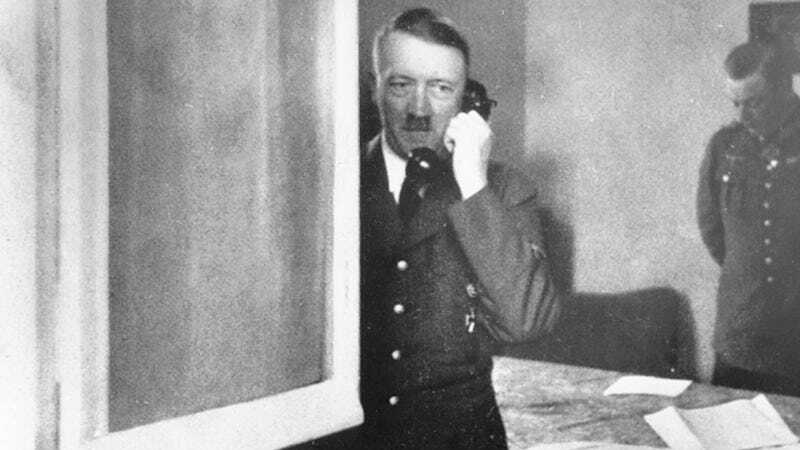 Adolf Hitler's Porcelain Alsation sold for US $ 20,000 A telephone used by Adolf Hitler during World War Two has been sold for US $243,000 (£195,744) at a US auction.The identity of the buyer, who bid by phone, has not been revealed. 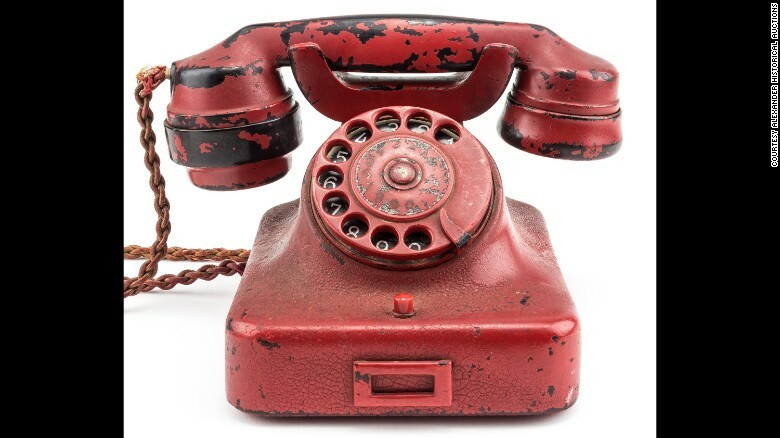 The bidding in Chesapeake City, Maryland, started at $100,000.The red phone, which has the Nazi leader's name engraved on it, was found in his Berlin bunker in 1945.Soviet soldiers gave it to British officer Sir Ralph Rayner as a souvenir shortly after Germany surrendered. After the rapid expansion of the company's facilities in Allach the location was no longer sufficient, on October 1, 1937, part of the production was transferred to the premises of the SS training and exercise camp at KZ-Dachau in the building of the former powder press plant of 1915 [I know the building and passed it on my way to work at the Ordnance Supply Depot, sic]. The entire porcelain production was relocated there, whereas in Allach only art ceramics were produced. The space available in the Dachau building which was converted for this purpose was divided in such a way that there was no strict separation between Civil workers and KZ- prisoners. Professor Ktämer's modesty room was on the first floor, where prisoners were also employed. In the lower floor, where only prisoners worked, the porcelain mill and the construction of the forms were made. In the war years, simple utensils such as ointment containers and canteens were also manufactured in Dachau. The "Julleuchter", which was given away by Himmler at the Julfest (Mid Summer Night), was also made there. Workshops in the area of ​​Dachau, the porcelain factory was undoubtedly the prestige object preferred by Himmler. Amongst others, the singer and the actor Johannes Heesters were taken to the Dachau manufacturing plant in May 1941 to show off, Himmler's pet projects. Prisoners were probably used in the Allach plant as well as on the SS Dachau site. The working detail at Allach consisted, first of all, of about 18 prisoners, who were made up mainly of Germans, and and one Pole, who was a specialist in modeling. As Kapo is recorded, Erwin Zapf from Selb in Franconia. The prisoners were transported daily by truck to Allach. It was only with the existence of the sub-camp Munich-Allach-BMW plants that they were accommodated there. This first involvement with prisoners probably took place as early as in 1940. Due to a decrease in production due to the withdrawal of civilian workers to the front, a search of porcelain workers was conducted in all concentration camps. On July 4, 194, a selection of 13 inmates from Buchenwald were transferred to Dachau were used as porcelain makers and porcelain painters . At the end of 1941, a work force of 67 persons (including 28 workers, 24 clerks, nine apprentices, plus six SS men stood against 60 prisoners, two of them were responsible to collect coal from the Dachau railway yard, Another prisoner by the name of Franz Pirker, was supervising the porcelain kiln. The prisoners were taken daily via the Main Entrance through the SS-Military Camp to their workplace, and returned in the evening. Only the porcelain kiln workers were used to carry out the continued heating process in the kiln-fire room, who had constantly control temperature and performance of the ovens and thereby were accommodated in the combustion chamber and did not have to return to the camp. After several years the building decayed and until the demolition in January 1978 only ruins remained. Glazed white porcelain male figurine in a dancelike pose with the body twisted to the left, with both arms extended outward. The open mouthed face has a goatee, moustache, and pointy nose. The tasseled, pointed hat has a wide brim, flipped up to show the face. A scarf emerges from under the brim, wraps under the chin, and ties behind the neck. The v-neck tunic has a pointed hemline, with 4 tassels at the waist. The sleeves are elbow length and edged with fringe and a small ball and a v-neck undershirt has ¾ sleeves. The legs are crossed in a wide stance with bent knees. The tights have a back seam,with 4 jingle bells around the left calf. Crakow shoes, a slouched boot, are on the feet. It rests on a stone-like porcelain base. Allach porcelain jester figurine acquired by Adelia W. and Davis O. Morris when they lived in Munich, Germany, as part of the US Army occupation force from 1950-1953. One evening, a man came to their door with the figurine, offering it in trade. He gave it to the Morris's in exchange for a bag of coffee. This is model three of five figures in the Jester series, known as Zaddelrock or Moriskentanzer III, the Astute, produced in 1941. Allach Porcelain and the artist Richard Förster were commissioned by the city of Munich in 1937 to reproduce scaled-down figures of a 1480 Gothic sculpture created by Erasmus Grasser for the Dance House in Munich. The Moriskens were never for public sale, but were made exclusively for the city of Munich as gifts for visiting dignitaries. The city paid Allach 20 Reich Marks for each completed Morisken. Five of the ten figures were put into production. The porcelain figurine was donated to the United States Holocaust Memorial Museum in 2006 by Bobbi J. Morris, the daughter of Adelia W. and Davis O. Morris. Davis O. Morris attended the Armed Forces Staff College and War College. He was a first lieutenant in the United States Army in Munich where he was stationed for three and a half years, from January 1950 to July 1953. He served under battalion commander Col. James C. Bradford. He and his wife, Adelia, lived at 39 Ravenna Strasse, and later at 7 Wolkenstein Strasse. The couple had a boy and girl while living in Munich and had two more girls after returning to the United States. Morris continued n the Army after the war. He was awarded four bronze stars and served two tours of duty in Vietnam. In 1965, he returned to Germany and was stationed in Nuremburg and Stutttgart. Morris achieved the rank of Brigadier General. Helen Simmons found the figurine at Dachau concentration camp after liberation while working there as a US Army nurse. The figurine was donated to the United States Holocaust Memorial Museum in 1994 by Herbert Silverman. White porcelain figurine of a costumed musketeer presented to Dr. Joseph A. Witter by a group of recently liberated Jewish prisoners at Dachau concentration camp in appreciation for the aid he provided to sick and dying inmates. The musketeer was deisgned by Robert Forster. The figurines were made with slave labor at the Allach porcelain factory at Dachau. The Allach Porcelain Factory was taken over by the SS in 1936 and was under the direct control of Heinrich Himmler. It was one of the SS's first industrial enterprises. The first factory was at Allach, a subcamp of Dachau concentration camp. A second production site was set up at Dachau to specialize in the production of figurines. Dr. Witter was a surgeon and member of the US Armed Forces 101st Airborne Division, who participated in the liberation of the camp on April 29, 1945. His unit also participated in the liberation of Kaufering concentration camp. The Allach porcelain figurine was donated to the United States Holocaust Memorial Museum in 2007 by Sean P. Tully, the grandson of Joseph A. Witter. Rothschwaige belonged to the Allacher sub camp complex. The commander of the sub-camp Munich-AAllach (BMW) ,was Obersturmführer Josef Jarolin, under his command and subordinate to him were the sub-camps Karlsfeld OT and Rothschwaige. The sub-camp Rothschwaige can no longer be localized. Since July 1942, however, in Dachau, Kufsteinstrasse 12, had been a transit camp for Russian civilian workers, in which about 2,000 people that were accommodated there, who had been used as 'forced laborers' to work in Dachau firms like the paper factory Schuster. Possibly the later KZ-sub camp was built on a part of this transit camp. The International Search Service Arolsen (ITS) shows the first mentioning of the sub-camp Rothschwaige on July 19, 1944. A report of the 17th August 1944 indicates an occupancy of 512 Jewish prisoners and 19 functionaries for the period from 11 to 31 July 1944. From the reports of the survivors, it can be concluded that Rothschwaige was, first and foremost, a temporary transit camp for Jewish prisoners on their way from Auschwitz to the Allacher Camp Complex. The duration of their stay was a maximum of four to six weeks. All prisoners marched from the Dachau train station on foot to Rothschwaige, they were accommodated there into existing barracks. There are no Rothschwaige prisoners appearing on the handed-in strength reports of the Dachauer sub-commanders and sub-camps dated the 29th November 1944, 3rd April and 26th April 1945. Presumably, in addition to the Jewish prisoners, who came into the Allacher sub-camp complexes through Rothschwaige, further detainees were lodged in Rothschwaige, who were deported to other concentration camps after a few days. This probably included a transport of 1,045 Hungarian Jewish women and 'gypsies' as at the 20th November 1944 - who were listed as Karlsfeld prisoners and then transported on the 1st December 1944 to Ravensbrück. In contrast to Auschwitz, the detainees found their prison term in Rothschwaige as a relative improvement. 'We got hot food, a blanket and a bunk for sleeping'. Abuses and killings of prisoners are not handed down. Unknown is, whether and in what form the Rothschwaiger prisoners were drawn into the OT employment. The assignment of the prisoners to OT as an employer in the ITS directory is not comprehensible according to the reports and statements of survivors. There is different information about the closure of the sub-camp. One survivor dated the re-location of the camp to Allach as the 31st July 1944. The international search service shows the last indication as the 31st March 1945. In the camp memorial Dachau, 30 Jews are named, who were liberated here. It would be conceivable that in the course of the overcrowding of the sub camps Allach BMW and Karlsfeld OT in the last few weeks prisoners were also brought to Rothschwaige. On the site of the former transit camp, there are still two dilapidated barracks. A part of the terrain is now used as an accommodation for temporarily settlers. The Bartolith Factory was founded in Munich in April 1942 by Christian Seidl to produce patented timber boards made of wood and cement. The manager was Christian Seidl, who had been supported by his son Norbert since 1943. While Christian Seidl was not a member of the NSDAP or any other national-socialist group, Norbert Seidl joined the NSDAP (Nazi Party) in 1940 and became district leader (Ortsleiter). The first large order was made for the Bartolithwerke with 10,000 building boards for the building of barracks for the SS Construction Management Süd at Dachau in 1942. At that time the company Barftolith did not have sufficient capacity with only six employees in Munich-Freimann to carry out this order. Therefore, Christian Seidl submitted a request the detention of prisoners from the KZ-Dachau. Before the prisoners were taken to the Mühldorfstrasse, however, a sleeping and housing barracks, sanitary facilities and two watchtowers had to be erected and the entire camp had to be secured with barbed wire. On the 28th of August 1942 Hauptscharführer Friedrich Müller came to Freimann as a commanding officer with an advance party of 30 prisoners and his guards. These detainees were first used to build the production facility. On the 12th of November, 1942, a permanent working commando of 30 prisoners and the Kapo Karl Kirschmeier was assigned to Munich-Freimann. In the following week, the number of prisoners increased to about 70 to 80, among them were mainly Germans, Yugoslavs, Czechs and Poles. In the winter of 1942/43 the production began in the Bartolith Works. Divided into 'production groups', the prisoners had to meet a certain daily target of building boards from six in the morning to 1800 hours in the evening. The only interruption, was a midday lunch break. The food for the prisoners was brought from the KZ-Dachau on a weekly basis by truck to Freimann. The food ration was inadequate, as the management took parts of it for their civilian workers. The supply degenerated so far that prisoners dug frozen potatoes from a nearby potato field in the winter. After eating these potatoes, some fell ill and were transferred back to Dachau. The prisoner, Josef Leitmeier, had become a valuable worker as a construction supervisor for the Bartolith works, and for this reason Norbert Seidl tried to negotiate his release from the KZ-Dachau. Josef Leitmeier was given leave [ Leave 'Urlaub' only ,he was never free and remained a prisoner. sic] on the 30th of October, 1943, under the condition of service only at the Bartholith Works. During this time, Leitmeier took over the construction of a second Bartholith plant in Erding. [He probably was an Engineer by profession,sic]. No KZ-prisoners were employed for these construction works, but prisoners of war and foreign civilian workers. Both SS-Guard Details and Norbert Seidl mistreated prisoners, if they worked too slowly in their opinion. Commander Müller urged the prisoners to work at an ever-higher rate because he received a monthly premium from the management, depending on the production figures achieved. Deaths in this sub-camp did not occur, however, how many prisoners died from consequences of malnutrition and hard physical work remains unclear. According to Norbert Seidl, the prisoner's commando was canceled after completion of the order for SS construction management in July 1943. Instead, jailed inmates from Stadelheim prison were used in the Bartolith factories. Father and son, were not held accountable during the De-nazification proceedings in 1948 because of no deaths of prisoners while managing the company Bartolith. In 1967, however, Johann Leitmeier, [whom he wanted released from Dachau.sic] accused and charged Norbert Seidl, at the Munich public prosecutor's office for ill-treatment of prisoners in sub-camp Bartolith. After further investigation, the procedure was terminated in 1970, because no killings were committed by him. The Central office of the Landesjustizverwaltung led after 1973 another Re-investigation, but in 1974 joined the judicial decision of the regional court Munich and ceased further proceedings. Commander August Müller was sentenced to ten years' imprisonment in the context of the Dachauer trials.